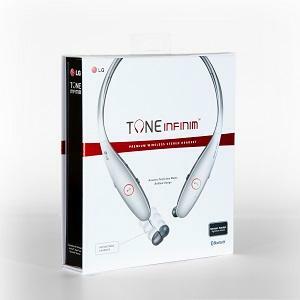 The LG TONE INFINIM stereo headset with Harman Kardon Signature Sound delivers a high-end wireless experience with unrivaled style, near effortless ease of use, and premium audio quality. 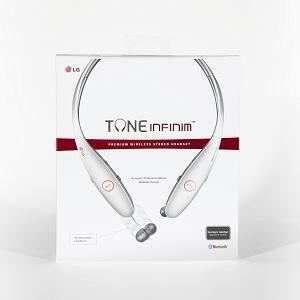 Box Includes: Tone Infinim (HBS-900) USB Charging Cable (Wall charger not included) Ear Gels (2 Sets) User Manual & Warranty Card Quick Start Guide. Acoustic Perfection Meets Brilliant Design! LG Tone Infinim provides cutting edge design, convenient technology, high level of performance and reliability in a mobile device. Discover the innovative style, elegant convenience, and exceptional quality of the LG Tone Infinim Premium Bluetooth Stereo Headset. 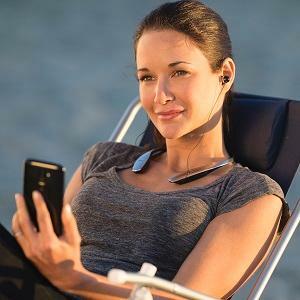 The Tone Infinim is ideal for people who enjoy cutting-edge design, convenient technology, and a high level of performance and reliability in a mobile device. The sleek metallic finish and ergonomic design will get you noticed,and Harman Kardon Signature Sound delivers premium audio quality. Keep up, stand out, and stay ahead with the innovative style and premium sound of Tone Infinim, the ultimate audio solution for life on the go.